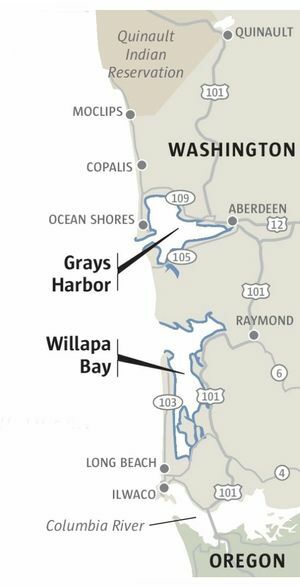 The state has approved plans to spray in Willapa Bay a neurotoxic pesticide that has a warning right on the bottle: “Do not apply directly to water.” What could go wrong? As a retired nuclear power-plant operator, Ross Barkhurst, 70, is by no means an environmentalist. In fact he spent his career clashing with them. The state disputes that, but surprisingly that’s pretty much the conclusion of two of the biggest environmental regulators in the country, the U.S. Fish and Wildlife Service and the National Oceanic and Atmospheric Administration. Both opposed the spraying program, arguing it’s experimental and could have unintended side effects on fish and other wildlife. It got the green light anyway. The backstory here is there’s a tiny burrowing shrimp that can loosen the intertidal soil so much it turns it into a black mayonnaise-like goo. Oysters sink and suffocate. So the oyster industry for years killed these native shrimp using a pesticide called carbaryl. But the use of that one got restricted. In its place, oyster growers have proposed spraying imidacloprid, a neurotoxin used in everything from flea poison to termite spray to farm insecticides. Not surprisingly, the idea of spraying this directly into marine waters for the first time did not go over well with environmentalists or even other environmental regulators. “I understand the concern that there’s an experimental basis to this,” said Rich Doenges, the water-quality manager for the state Department of Ecology who signed off on the permit. Doenges added that the new pesticide is considered less damaging than the old one. He said the growers, who raise 25 percent of the oysters in the U.S. just in these two bays, are looking at severe damage from the shrimp if they don’t act. “They’re at a loss for what else to do,” he said. While other agencies acknowledged the complicated plight of the oyster growers, who have also been struggling with ocean-acidification issues, they were blunt in condemning this spraying plan. The U.S. Fish and Wildlife Service added that because the pesticide was designed for use on land, there’s little information on how it might affect anything marine from zooplankton to the green sturgeon, which feeds in the bay and is on the Endangered Species List. This pesticide is also believed to be a major cause of bee-colony collapse, and as a result has been banned or partially banned in some European countries. The state argued this wasn’t relevant because there aren’t many bees at Willapa Bay, other than hives brought in about five miles away to pollinate the commercial cranberry bogs. Trina Bayard, the director of bird conservation at Audubon Washington, said she got the sense the state would back the oyster growers’ plan no matter what, because it’s such a beloved industry. Doenges, of Ecology, said spraying is likely to begin May 17. People have until May 16 to appeal the permit to the Pollution Control Hearings Board. “We realize there are a lot of concerns, but we are confident this is going to work,” he said. Barkhurst, the nuclear engineer, said it’s hubris from a state that boasts constantly about its environmental sensitivity.